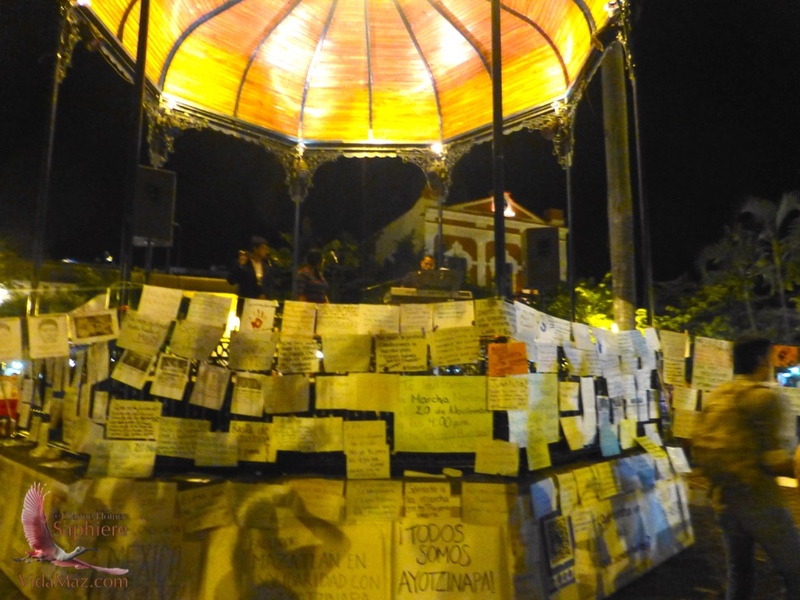 How is Mazatlán Dealing with Ayotzinapa? | ¡VidaMaz! How is Mazatlán Dealing with Ayotzinapa? I’ve had quite a few friends and colleagues ask me how the reaction has been here in Mazatlán to the horrifying and heartbreaking Ayotzinapa events. I tell them that everyone here that I talk with is outraged, but, sadly in my opinion, not much is being done about it. I have told them disappointedly that we on the west coast are a long way away, both geographically and psychologically. I tell them about one march that was held here, but that it seemed to me to be like so many other peace marches…no real public engagement and nothing very meaningful other than, perhaps, to those who participated. I was so happy, therefore, to be proven wrong in the Plazuela on Saturday night. God bless the students—they are not giving up! They will hold another march this Thursday, November 20, from 4:00 pm. Please put it in your calendars! Gather in front of the Palacio Municipal in the Plaza República, and we will march towards UAS. Thursday there is a call for people nationwide to wear black, in memory of the lost students, so I assume we will wear black in the march as well. Once we arrive there, the students will hold a cultural festival in the library, in memory of their departed fellow students. The festival will include live music, theater and dance. The students were letting people know about this march amidst the happy revelry in the Plazuela on a Saturday night—amidst the live music, dancing and dining, during the world premiere of the Angela Peralta opera. And they were doing it in a most magnificent way! I’m sure many of you saw it, and perhaps, as I did, participated. The students had hung out photos of the kidnapped (and supposedly murdered) students, with brief biographies. They had white paper and markers ready to hand to anyone who wanted to express themselves. Some pictures below; click to enlarge or view a slideshow. And express they did! The outrage, the disgust, and the hurt were palpable. The resulting display was heart-wrenching and powerful. It was gratifying to me to see Mazatlecos make their voices heard. I pray it has influenced even a few more people to become more civically engaged, and help to make our beloved, adopted home the best it can be. We all need to say “no” to corruption, north and south of the border. Honesty, respect and responsibility begin with each of us. I hope to see you Thursday! That was such a sad event and we did hear all about it in the Canadian news anyway, we all talked about it and wished so much something would be done about it. I am thrilled to hear the students are not letting go. Definitely try to be there on the 20th! So happy to hear it, Lorraine!!! Thank you!